1 Material safety data sheets are at the fingertips of all employees. 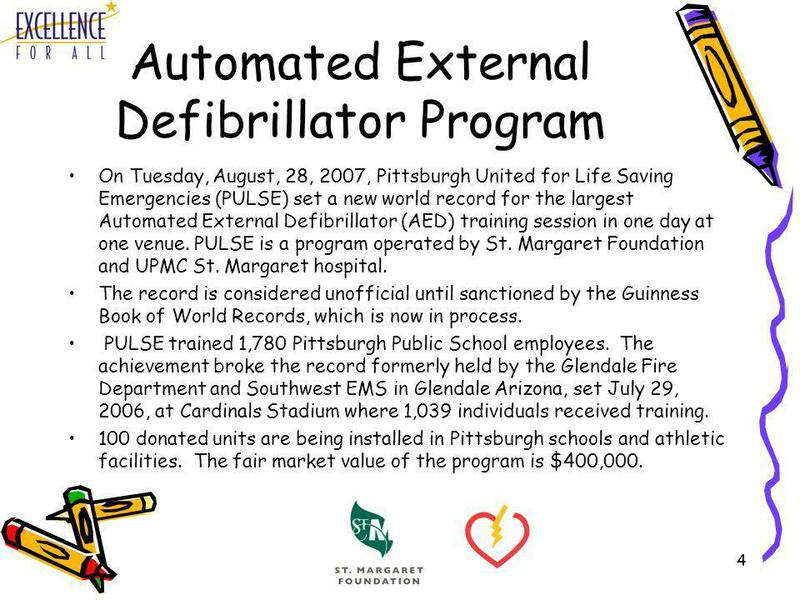 4 4 Automated External Defibrillator Program On Tuesday, August, 28, 2007, Pittsburgh United for Life Saving Emergencies (PULSE) set a new world record for the largest Automated External Defibrillator (AED) training session in one day at one venue. PULSE is a program operated by St. Margaret Foundation and UPMC St. Margaret hospital. The record is considered unofficial until sanctioned by the Guinness Book of World Records, which is now in process. 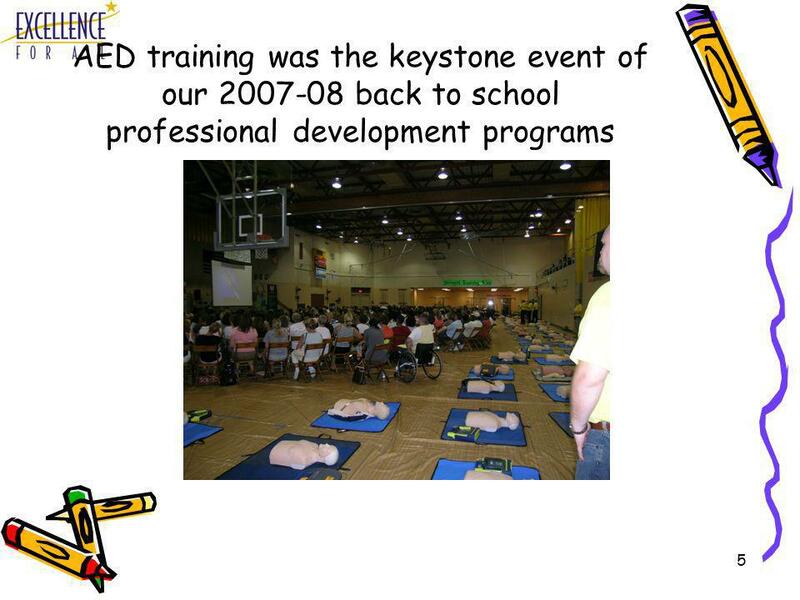 PULSE trained 1,780 Pittsburgh Public School employees. The achievement broke the record formerly held by the Glendale Fire Department and Southwest EMS in Glendale Arizona, set July 29, 2006, at Cardinals Stadium where 1,039 individuals received training. 100 donated units are being installed in Pittsburgh schools and athletic facilities. 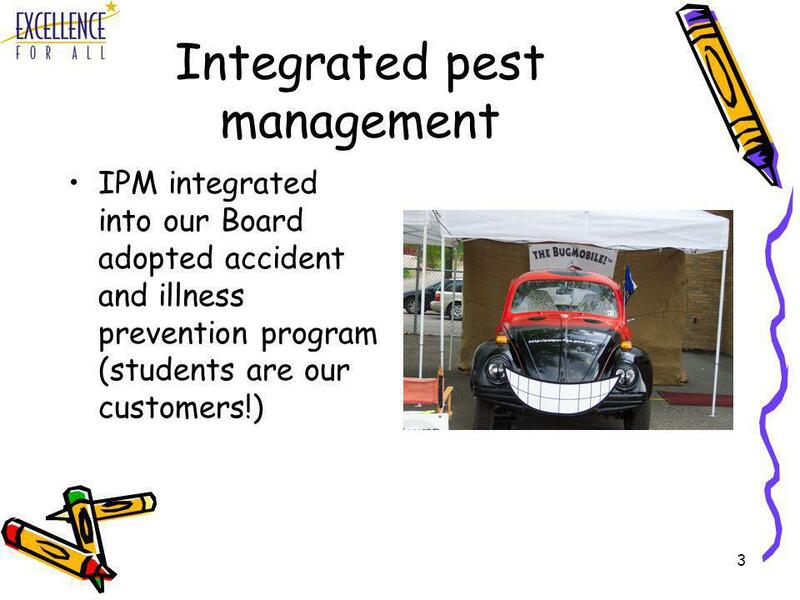 The fair market value of the program is $400,000. 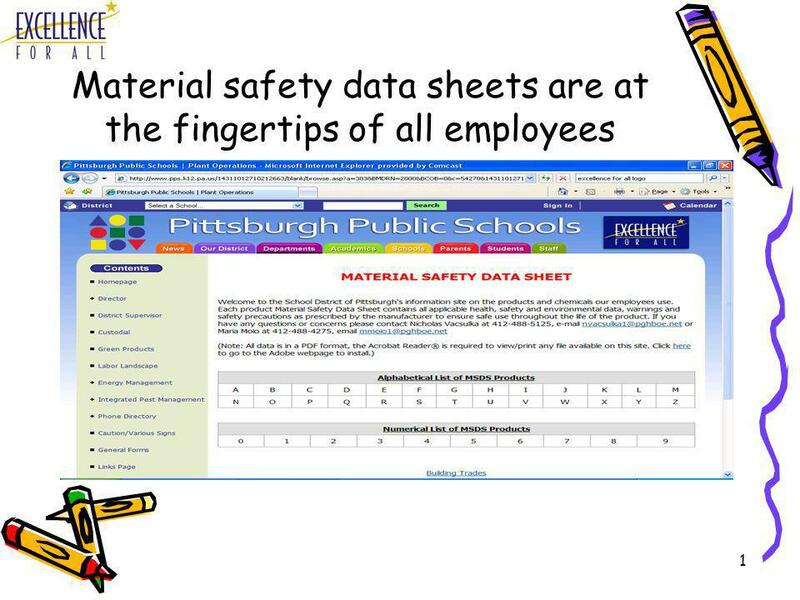 Download ppt "1 Material safety data sheets are at the fingertips of all employees." 2009 HBR Safety Excellence Awards Best Practices. Rapid HIV Testing in Labor & Delivery: A Safety Net to Prevent Perinatal Transmission Margaret A. Lampe, RN, MPH Centers for Disease Control & Prevention. Energy Policy Act of 2005 Section 1221 & 368 Update Board Meeting – Los Cabos, Mexico December 7 & 8, 2006. Senate Committee on Health and Human Services February 10, 2009 Overview: Texas Department of State Health Services David Lakey, M.D. Commissioner. Tuesday, 22 April 2014 The Foundation Trust Experiment and UCLH Presentation to Civitas 22nd October 2007. Houston Independent School District Town Hall Meeting Sharpstown Feeder Pattern November 27, 2007. Highlights From Mary Lous Presidential Year White Tanks Rotary Club. 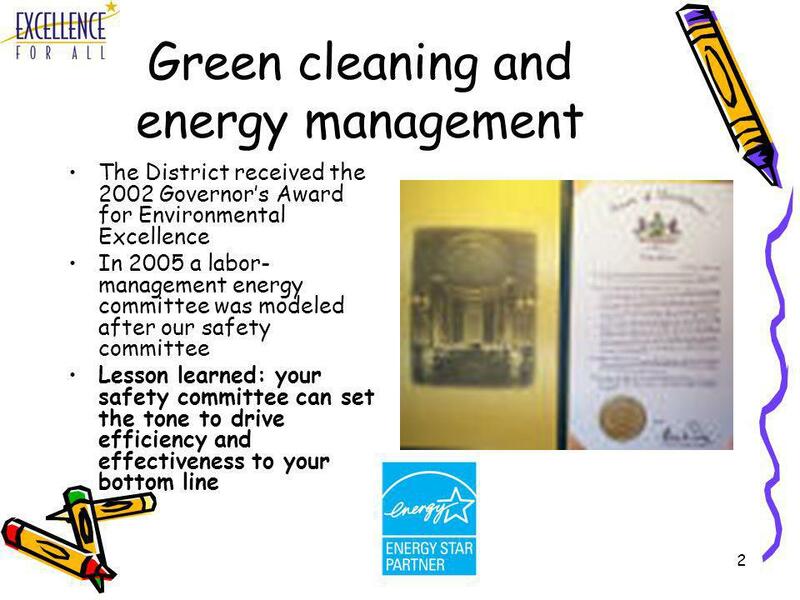 Environmental Management System California United Terminals. Facilities Services Administration Building Five-S Project Presented by Charles Kennedy.